It's been days, absolutely days, since the Thanksgiving feast, and you're looking awfully skinny. Luckily, we have officially entered Christmas Cookie Season, so it won't be hard to remedy this situation. My esteemed sugary suggestion? 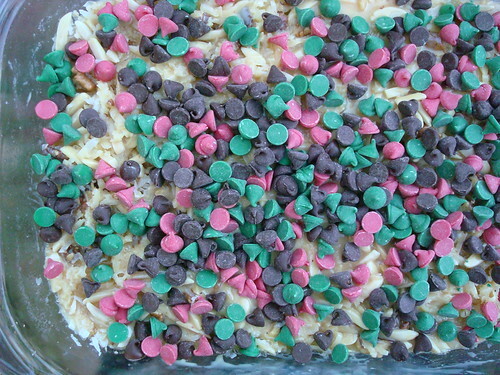 Holiday Magic Cookie Bars with a Shortbread Crust. 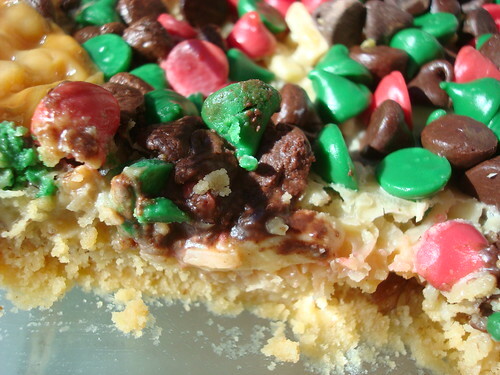 Now, if you already know what a Magic Cookie Bar (or 7-layer bar, or Hello Dolly Bar, etc) is, then you know that these decadent bar cookies, made with a buttery graham crust topped with a slurry of condensed milk, nuts, chocolate and/or butterscotch morsels, and coconut, are pretty much heaven on earth. 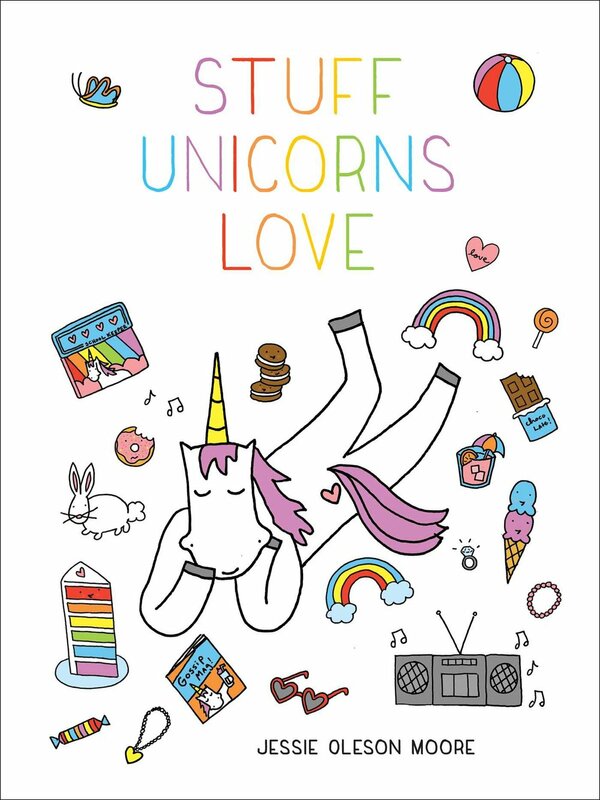 But there's always room for more magic, right? 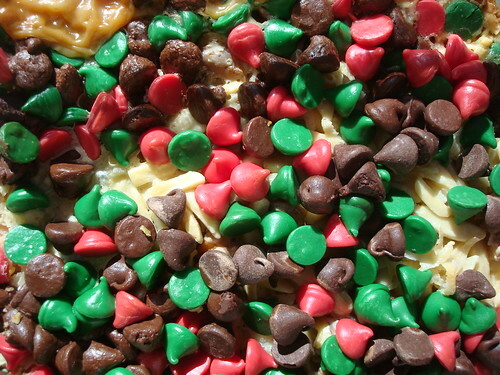 I got the idea for these bars when I spied Nestle Toll House Holiday Morsels (have you ever seen them? I hadn't!) in the grocery store, accompanied by recipe cards. Naturally I thought the bars would look adorable all dressed up for the holidays, and considering I still had a ton of shortbread from Walker's Shortbread (who sent me samples, and with which I've already made one of my new favorite things, Million Dollar Shortbread Bars), I decided to do a recipe mashup. And I can now report that yes, the bars get even better when you swap the graham crackers for crushed-up shortbread cookies in the crust. This magical union of shortbread, butter, and all of the delightful toppings makes for a sort of no-holds-barred extreme richness on all sides that will make your mouth and soul happy. These are an ideal morsel for a cookie exchange or holiday party, as they're decadent to eat and festive to look at, too. As for the coconut haters? 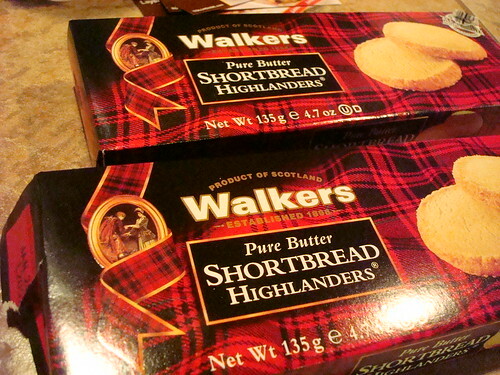 Sorry, but they're just not the same without! 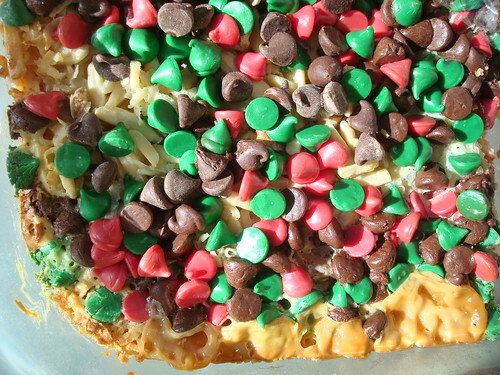 Here's the recipe, adapted lovingly from "Yuletide Layer Bars" by Nestle Toll House. Melt butter in a 13x9" baking pan in oven; remove from oven. Sprinkle shortbread crumbs over the melted butter; stir well, and press onto bottom of the pan (it might get hot, so press with a sheet of waxed paper or the back of a rubber spatula). Sprinkle the nuts and coconut (make sure they are evenly distributed). Gently, so it doesn't disturb your carefully laid-out toppings, pour the sweetened condensed milk evenly over top in an even layer. If you need to distribute the milk, tilt the pan rather than stirring, as the crust might be torn up if you are too vigorous. Sprinkle the morsels on top. Bake for 25-30 minutes or until light golden brown. Transfer to a wire rack to cool completely before slicing into bars with a very sharp knife.